Zebra 105SL and 105SL Plus - our Genuine Zebra labels for Zebra 105SL and 105SL Plus printers are supplied on 76mm cores. The Zebra 105SL printer can use both direct thermal and thermal transfer labels. If you are using thermal transfer labels with your Zebra 105SL printer, you will need to use a thermal transfer ribbon to print onto the label - we sell Zebra thermal transfer ribbons for the Zebra 105SL printers here. The Zebra 105SL has a maximum width of 104mm. The Zebra 105SL and 105SL Plus is a 4 inch wide industrial on-demand label printer. FeedYourZebra.co.uk is a website operated by Smart Print and Labelling Limited - an Authorised Zebra Reseller with more than 10 years experience. Most of our Zebra ZipShip labels are available for immediate shipment to the UK, France, Germany, Netherlands, Spain, Belgium, Italy, Norway, Sweden, Denmark, Finland, Luxembourg, Austria, Ireland. You can check out our delivery options and charges here. Zebra barcode labels for Zebra 105SL printers ensure reliable, high-quality printing. Our Zebra 105SL direct thermal and thermal transfer barcode labels are performance-matched to Zebra 105SL label printers for crisp, dependable output. FeedYourZebra supplies only Genuine Zebra direct thermal and thermal transfer labels for the Zebra 105SL industrial printer. The Zebra 105SL printer has a maximum label width of 104mm and labels are supplied on 76mm cores - please be sure to select the correct labels for your printer. 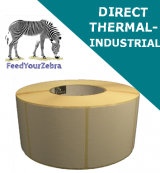 FeedYourZebra.co.uk direct thermal and thermal transfer labels for Zebra 105SL label printers. If you are using thermal transfer labels, you will also need thermal transfer ribbons for the 105SL available here. If you need any assistance you can contact us here. When using thermal transfer labels, you will need to use a thermal transfer ribbons to print an image. We also stock a range of thermal transfer ribbons suitable for the Zebra 105SL printer in wax, wax / resin and full resin formulations. We are able to sample rolls for testing prior to order - please contact us here to request. Our Genuine Zebra labels are guaranteed to work with Zebra 105SL label printers. Zebra Z-Select 2000D - a smooth bright white, topcoated direct thermal label stock which produces high contrast black images with Zebra thermal printers. The thermally sensitive top coating ensures maximum printhead life, gives superior smudge resistance and protects the label from environmental conditions. The adhesive gives good performance across a range of temperatures and on a wide variety of surfaces. Zebra Z-Select 2000D is not recommended for applications involving long term exposure to sunlight or extreme heat. Zebra Z-Perform 1000D - a white economy uncoated direct thermal paper label, which produces black visible light images with Zebra thermal printers. The acrylic based adhesive offers good initial tack and adhesion on a wide range of surfaces. Zebra Z-Perform 1000D is not recommended for applications involving long term exposure to sunlight or extreme heat. Zebra Z-Perform 1000T - an uncoated, supercalendered thermal transfer paper label stock, which produces scannable barcodes and acceptable images when matched with Zebra thermal transfer ribbons. The general purpose permanent acrylic based adhesive offers high initial tack and adhesion on corrugated packaging materials for applications of less than three years (indoor usage). Zebra Z-Perform 1000T is recommended for use with Zebra 2300 and Zebra 2100 wax thermal transfer ribbons. Zebra Z-Select 2000T - an ultra smooth topcoated white paper label stock, which produces excellent quality images, including rotated barcodes, graphics and small images, at speeds up to 305mm per second. Compatible with Zebra 2100 and Zebra 2300 wax thermal transfer ribbons and Zebra 3400 wax / resin thermal transfer ribbons for standard thermal printing. Suitable for use with Zebra 3200 wax / resin thermal transfer ribbons for applications requiring improved smear and and scratch resistance. Zebra 8000T Cryocool - thermal transfer printable polypropylene label coated with a high performance acrylic adhesive for use in cryogenic applications. The adhesive offers resistance to temperatures as low as -196C for liquid nitrogen applications. It is designed for use with Zebra 5095 resin ribbons to produce excellent print quality. The smear and scratch resistance together with low temperature performance make 8000T Cryocool and excellent choice for applications requiring a combination of image durability and extreme low temperature adhesion. Zebra Z-Ultimate 3000T White and Zebra Z-Ultimate 3000T Silver - a top coated gloss polyester thermal transfer label stock with excellent print quality, available in gloss white and gloss silver. Coated specially for use with Zebra 4800 and Zebra 5095 resin ribbons to provide outstanding print quality and image durability. High strength acrylic adhesive offers superior strength and adhesion for a wide variety of surfaces. Unparalleled smear and scratch resistance for a thermal transfer label.